Electron microscopes use a beam of electrons in the same way light microscopes use a beam of light to image samples. There are two main types of electron microscope. The transmission electron microscope projects a the electron beam through a thin sample. After passing through the sample the image is magnified and projected onto a fluorescent screen or camera. The scanning electron microscope focuses the electron beam to a fine point, which scans across the surface of the sample. Electrons are produced as a result of the beam-specimen interaction and are emitted from the surface layers of the sample and subsequently picked up by electron detectors. Bulk samples can be imaged in the SEM. Why use an electron microscope? Microscopes are often defined by their resolution and magnification limitations. MAGNIFICATION is the process by which the appearance of something is enlarged so that we can see structures that we would not be able to with our eyes. Lenses can be used to magnify an image many times, but at some point you will reach the RESOLUTION limit of the system. RESOLUTION is the point at which you can see two objects as distinct from each other. For example, if you were to look at a car heading towards you at night the two headlights would at first appear as a single light. At some point they would be two separate lights and that would indicate the point at which the resolving powers of your eyes has been reached. The RESOLUTION in a microscope is linked to the physical properties of the particle used to image it combined with the characteristics of the optical imaging system. In good microscopes the theoretical resolution is approximately half the wavelength of the light or electrons used. Electrons have a wavelength that is approximately 100,000 times smaller than that of visible light.Thus electrons are able to resolve smaller structures than light. Many biological structures are smaller than a cell and normal light microscopy cannot image them. For these structures electron microscopy or atomic force microscopy (AFM) can be used. It should be noted that there are some advanced light microscopy techniques have relatively high resolutions (such as super resolution microscopy) but have not matched the resolution obtained by EM or AFM. While important, the wavelength is not the only factor affecting resolution. The optics of the instrument are very important. While our eyes detect light, limitations in the size of the photoreceptor cells in our retina and the distance between them mean that the resolution of our eyes is limited to approximately 500 times the wavelength of visible light (400-750nm). In BIOLOGICAL ELECTRON MICROSCOPY, it is nearly always the SAMPLE that is the limiting factor rather than the instrumentation! When electrons are accelerated while In a VACUUM they behave in a manner similar to light. Electrons will travel in a straight path unless exposed to electric and magnetic fields. ELECTROMAGNETS can be used to focus electrons in the same way glass lenses can be used to focus light.  When electrons interact with a sample the main beam electrons are either transmitted or scattered via elastic and inelastic scattering events. Specimen-beam interactions can result in the following. Electrons can be absorbed by the sample. The degree to which this occurs relates to sample thickness and composition. The path of main beam electrons can be altered to such a degree that they are reflected back out of the sample, creating BACKSCATTERED ELECTRONS (BSE). BSE are a common type of electron detected in a SCANNING ELECTRON MICROSCOPE. Main beam electrons can transfer energy to orbiting electrons within the sample causing them to be excited and emitted as low energy SECONDARY ELECTRONS (SE). SEs are probably the most common electrons detected in a SCANNING ELECTRON MICROSCOPE. The resultant energy differential within atoms created as a result of SE emission causes a redistribution of electrons and the production of photons (cathode-luminescence) and x-rays (x-ray microanalysis), which can also be imaged using specialized detectors. A type of electron scattering in distinct directions due to crystalline samples. The images produces resemble a pattern of dots. Electron crystallography uses diffraction to work out complex structural arrangements at very high resolutions. 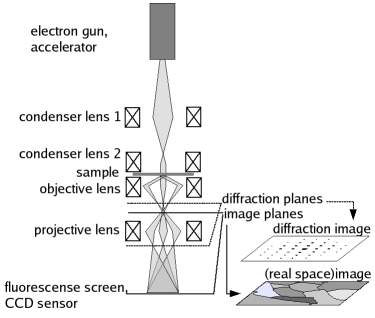 Diffraction is usually produced in a TRANSMISSION ELECTRON MICROSCOPE. The gun is the part of the microscope that produces the electrons and is responsible for their acceleration into a beam. The gun is composed of a filament, Wehnelt cylinder and an anode. 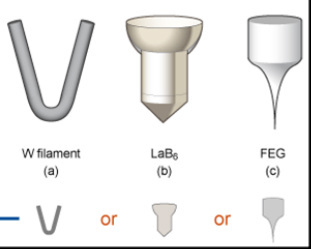 There are several types of filament, as shown in the image on the right. The W filament is the standard tungsten filament. It has a relatively low cost and is easy to maintain. The LaB6 crystal has a longer life-span and produces a slightly brighter and more cohesive beam. The field emission gun (FEG) is the best type of gun and by far the most expensive to purchase and maintain, but is not always available or needed. Routine imaging of biological specimens often only requires a W type filament and lab managers are able to change the filament themselves without needing to call out an engineer. These are positioned along the column of the microscope and are used to control the electron beam. CONDENSER LENSES focus the beam onto the specimen while the OBJECTIVE LENS either provides the first magnification (TEM) or focuses the beam to a point that scans across the specimen using the scan coils (SEM). The TEM also has DIFFRACTION and PROJECTION lenses. The lenses produce a magnetic field along the path of the electron beam. The electrons spiral around the magnetic field lines. In older TEMs increasing and decreasing the magnification (by ichanging the power of the objective lens) would result in the image rotating as the electron spiral was tightened or relaxed. Modern TEMs correct for this rotation. It is the shape of the lenses that create a field to focus the electron beam. Electromagnetic lenses can produce a lot of heat and are often cooled using circulating water or coolant. A vacuum is essential for electron microscopes. There are environmental scanning electron microscopes that operate at reduced vacuum levels, compared to most EMs, but the resolution is often limited as a result and these instruments are exceptions that use backscattered electron imaging. Modern electron microscopes have differential vacuums along the column, enabling the area around the filament to have the highest degree of vacuum. High vacuum systems require a specimen airlock through which the sample is introduced to the specimen chamber. This speeds up the rate of specimen exchange as only a small volume of air needs to be pumped out. There is an elaborate pumping system for the electron microscope column. If the vacuum is broken the microscopes will protect the filament by shutting down the electron emission. Several types of vacuum pump are used to create and maintain the system. ROTARY PUMPS pump from atmospheric pressure but can only achieve a relatively low vacuum. DIFFUSION and TURBO MOLECULAR pumps can create higher levels of vacuum. ION PUMPS are often used in field emission gun (FEG) systems to produce very high vacuum levels. The electron beam passes through a series of apertures with different diameters. These apertures stop scattered electrons, control the level of sample exposure to the beam and assist in limiting the optical artifacts common to all microscopes. Usually each lens has up to four different apertures. The diameter of the apertures in the lower condenser lens, the objective lens and the diffraction lens can be selected from outside the column. Each aperture has to be carefully aligned in order to optimise image resolution.